Guru Dass is a direct disciple of Yogi Bhajan (Kundalini Yoga) and Ramesh Balsekar (Advaita/Vedanta philosophy). He began his spiritual quest as a teen in the United States, having his first Kundalini Yoga experience at the Woodstock Festival in 1969. By the time he was 18 he was living in an ashram and teaching Kundalini Yoga. At 20 he had traveled to India and studied with different masters. In the 70’s he pioneered Kundalini Yoga in Spain and Europe. He has trained hundreds of Kundalini Yoga teachers worldwide and inspired many by speaking in a manner that frees the mind and opens the heart. 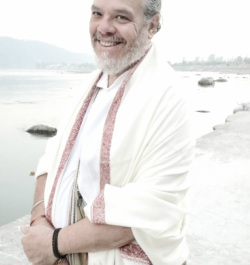 Guru Dass is the founding director of the International College of Kundalini Yoga. He is a certified KRI Level I and Level II Lead Trainer. He is also one of the founders of IKYTA (International Kundalini Yoga Teacher's Association) and a member of KRI's TTEC (Teacher Training Educational Council). He holds a PhD in Philosophy and Religion, and is a chiropractor and healer. He presently lives in Sweden and travels the world sharing his knowledge and music. He has recorded numerous mantra and spiritual song CDs.